The home run is indeed baseball's ultimate weapon. It can change a game in a heartbeat, making a tight game into a blowout or a seemingly easy win into a nail-biter. Homers are majestic, powerful, and awe inspiring. And sluggers are the sport's biggest stars, from the days of Babe Ruth through Barry Bonds. Unfortunately, due to sales rights restrictions, we cannot offer Home Run for sale in your country. David Vincent, called"The Sultan of Swat Stats" by ESPN, delves into the long history of the home run with great detail and color. He starts when the rules of the game were highly unstable and sometimes the definition of a home run could change in a park from year to year; follows through the "Deadball Era," when the home run was rare; explores the explosion Babe Ruth brought to baseball in the 1920s; discusses how both world wars affected homer statistics; looks at great home run races such as Maris versus Mantle in 1961; assesses the effects of the juiced ball, juiced players, thin air, and smaller ballparks; and so much more. If there is something to know about home run history, look to David Vincent for the answer-Major League Baseball does. 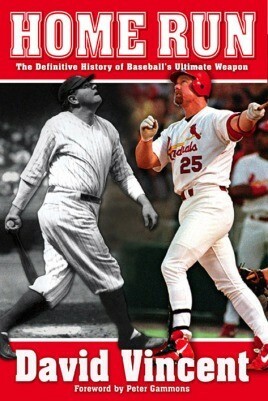 With Home Run: The Definitive History of Baseball's Ultimate Weapon, now you can know it too. A 1990s Nike commercial proclaimed that "chicks dig the long ball." In this thorough and colorful look at baseball's ultimate weapon, David Vincent shows you why.